Time for Catholics to Get on Board! Electronic Books! Bible Study Software! Catholic Software! On Monday, Steve will join Catholic Connections (9-10 AM Eastern) and Catholic Answers Live (7-8 PM Eastern) to discuss Electronic Bible & Catholic Study. He will provide resources and advice how to get started. Test Drive Logos Bible Software, click here. Visit Budget Scripture Software for the latest and best software at the guaranteed lowest prices. Thegoal is not to make money but to get Catholics using Bible software. NEW! Jimmy Akin's Comments on Logos and Harmony Media. I agree–Logos is fabulous for Bible study, Harmony is fabulous for Catholic study. The two make a great team. VATICAN CITY, SEPT. 15, 2006 (Zenit.org).- Benedict XVI and Cardinal Tarcisio Bertone agree that the role of Vatican secretary of state is above all as a pastor of the Church. The Pope said this today at a ceremony in Castel Gandolfo in which he welcomed Cardinal Bertone in his position as his first collaborator. Cardinal Bertone, 71, today assumed the position of Vatican secretary of state, replacing Cardinal Angelo Sodano, 78, who presented his resignation for reasons of age. Speaking of the role of the secretary of state, Benedict XVI said: "This work in the Curia is, in reality, a pastoral work in an eminent sense, as it really helps to guide the people of God." 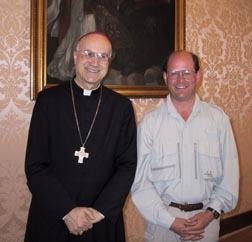 Cardinal Bertone added: "I undertake a peculiar and different mission in regard to those that have been entrusted to me to date. However, I am happy because its undeniable pastoral character gives continuity to the missions we have already carried out. "I am aware of the enormous responsibility it entails, as well as the gravity and complexity of the issues that I will have to address daily. My sole ambition is to fulfill the motto of my episcopal service: 'Fidem custodire, concordiam servare'" (guard the faith, preserve concord)." Cardinal Bertone, the second in command in the Vatican since his appointment as Secretary of State, released a statement to clarify what the Pope actually said and meant in his speech a few days ago. The Pope's comments were misconstrued by many Muslims and caused a furor in many Islamic countries. I think we should be more frank about Islam but I understand the Pope's position and desire to dialog. I suspect "ecumenical" efforts with Islam are a waste of time but I guess it is the Christian thing to do. Many Christians in the Middle Ages concluded you don't dialog with radical Islam, you fight it.